Shelob’s Lair Pt. 7 ~ Frodo attacked by Gollum (#7 of 9). I already said in the last post how good I think Elijah Wood is in the scene, first goaded, then attacked by Gollum. I should add that Andy Serkis is excellent, too. 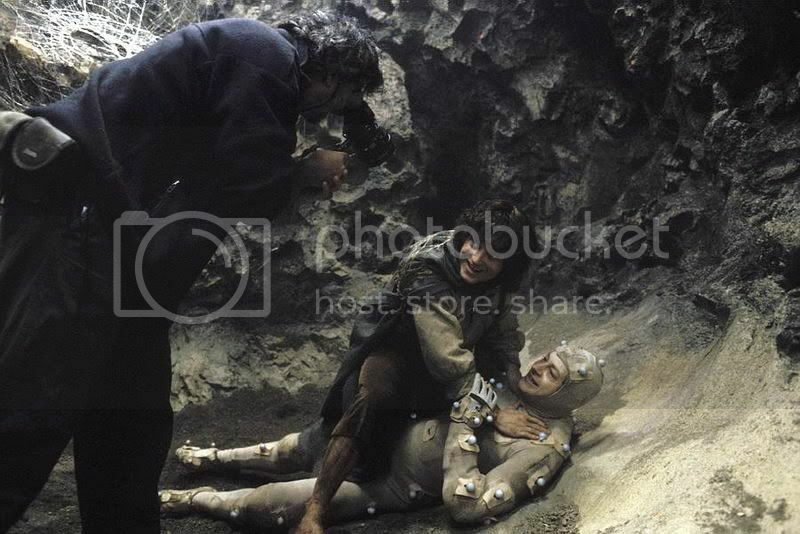 The behind-the-scenes extras show that Andy was on board to rehearse and act this scene (unlike the Stairs of Cirith Ungol, in which the part of Gollum was read by another). Andy Serkis is an extremely committed actor, with an intense performing style. I am sure working with Andy helped bring out the fire in Elijah Wood’s performance. As for the scene itself, the more I look at it the more I think the screenwriters’ based the scene not on the fight in the Shelob’s Lair chapter, but the one in Mount Doom. I think they used the “transfiguration” scene I was referring to in the last post, in which Gollum attacks Frodo, who is being carried by Sam. Frodo falls off, and he and Gollum struggle. To Sam, the two antagonists appear “locked together”, Gollum tearing at Frodo to get the Ring, Frodo fighting back “with a sudden fury” that amazes Sam, fury inspired by Gollum trying to get the Ring. Frodo throws Gollum off and rises up, quivering with rage, ordering him, “Down, creeping thing, and out of my path!” Gollum crouches before Frodo like “the shadow of a living thing,” a “creature now wholly ruined and defeated", yet "filled with a hideous lust and rage”. Frodo is "untouchable now by pity". Then Frodo seems to recover himself. Sam says he’ll take care of Gollum, and Frodo walks on, "slowly but erect", his mind seemingly elsewhere, towards the Sammath Naur. In the filmed Shelob’s Lair scene, the action is very similar. Frodo, just escaped from the web trap, tumbles out into a larger way, bruised and exhausted. Even before he can catch his breath, Gollum pounces. Gollum’s fresh attack, scrabbling at the Ring around Frodo’s neck, spurs Frodo to a furious counter-attack. Frodo gets the upper hand, and would surely throttle Gollum, eyes blazing, but Gollum appeals to Frodo’s pity. Unlike the book scene on Mt Doom, Frodo still is capable of pity. He releases Gollum, gets up, his mind re-focussed on the trial ahead (“I have to destroy It, Sméagol, for both our sakes”), and slowly walks on. Until I made these screencaps, I had been thinking the filmmakers based their scene on the book fight between Sam and Gollum in the Pass, but altering it into a fight for Gollum and Frodo. Recent reflection makes me think the scene much more closely resembles the book’s struggle on the slopes of Mt. Doom. The book scene telling of Sam rushing to catch up to Frodo as he runs ahead is posted after the caps. Just a note: I will be posting the “transfiguration” scene I have been referring to (with Frodo and Gollum fighting on the side of Mt. Doom), in which Frodo seems to Sam “robed in white”, but not until I get to the film’s Mt. Doom sequence. Frodo tumbles into a widening in the tunnel and Gollum jumps him, trying to take the Ring. Gollum: Got away, did it, precious!! Not this time! Not this time! Gollum, on top of Frodo, nearly gets his hands on the Ring. Frodo revives at this and throws him off. Gollum: (Gasping, trying to loose Frodo’s hands.) It wasn't us! It wasn't us! Sméagol wouldn't hurt Master! We promised! You must believe usss. It was the Precious! The Precious made us do it! Sam came up behind as fast as he could urge his legs; but glad as he was to be free, he was uneasy, and as he ran, he kept glancing back at the dark arch of the tunnel, fearing to see eyes, or some shape beyond his imagining, spring out in pursuit. Too little did he or his master know of the craft of Shelob. She had many exits to her lair…. Dread was round him, and enemies before him in the pass, and his master was in a fey mood running heedlessly to meet them. Turning his eyes away from the shadow behind and the deep gloom beneath the cliff upon his left, he looked ahead, and saw two things that increased his dismay. He saw that the sword which Frodo still held unsheathed was glittering with blue flame; and he saw that though the sky behind was now dark, still the window in the tower was glowing red. ‘Orcs!’ he muttered. ‘We’ll never rush it like this. There’s Orcs about, and worse than Orcs.’ Then returning quickly to his long habit of secrecy, he closed his hand about the precious Phial which he still bore. Red with his own living blood his hand shone for a moment, and then he thrust the revealing light deep into a pocket near his breast and drew his elven-cloak about him…. Hardly had Sam hidden the light of the star-glass when she came…. She was between Sam and his master. Either she did not see Sam, or she avoided him for the moment as the bearer of the light, and fixed all her intent upon one prey, upon Frodo, bereft of his Phial, running heedless up the path, unaware yet of his peril. Swiftly he ran, but Shelob was swifter; in a few leaps she would have him. Sam gasped and gathered all his remaining breath to shout. ‘Look out behind!’ he yelled. ‘Look out, master! I’m’—but suddenly his cry was stifled. So much incredible acting ability shown just in his face! I very much agree, Starlit! Although in this scene he shows that he's more than a face. His whole body is completely submerged in the character and his plight. He and Gollum are both super in this. I love Frodo getting angry and punching Gollum. Yeah Fro, that's it, forget being Mr Nice Guy, PUNCH that treacherous little git! Then, of course, his better nature, his true, fine self reasserts itself ... and he finds it in himself to pity this ruined creature who planned to murder him. “I have to destroy It, Sméagol, for both our sakes”. Love the way Frolijah delivers that line. Thanks, Pearl. And I love the way he does that line too--vocally and visually. His body language is perfect. He may have had to struggle to let himself play full-out anger, but he succeeded! I still am guessing Andy helped. I've seen behind-the-scenes shots of them clowning around playing or rehearsing this scene, but I am sure that from everything I've read about Andy Serkis, in LotR or in other roles, he would have given the scene 200%. When you are acting with someone who puts so much into a scene, it brings the most out of you. EW himself was said to put huge amounts of energy into each scene he played; I am sure he provided the very same impetus to other actors. I was going to say something relatively meaningful but then I saw the final pic and now I am just giggling and grinning!!! That really is a hilarious shot. I didn't make that one but found it roaming around the web one day. I saved it immediately. I guess it's from an extra, but I don't remember seeing it. But I haven't watched the extras for over a year. Next time I do, I'll keep an eye out for it in case the scene would make nice a nice sequence of caps. Oh yes! More from that would be nice! Amazing caps. The normally so beautiful and souldful Frodo... looking entirely wild, mad, enraged, desperate, about to throw up. The visuals really do speak for themselves concerning what's happening to Frodo, when seen like this. I agree that he looks lightyears away from his usual Frodo-self, but so he should. Still, it's rather alarming--and gripping--to see it. Do you think the post should be clowning-around pic free? I'd hate to ruin the effect just for the sake of providing an entertaining behind-the-scenes photo. This is a serious question, so let me know. No, I don't think the clowning should be removed. At the end of the day the serious ones are of an actor at his trade - and doing it extremely well. The clowning through contrast helps further demonstrate just how well, IMO. The clowning through contrast helps further demonstrate just how well, IMO. Whew! That's how I hoped it would be perceived, Maeglian. I think he and Andy are super in this scene, into their roles 150%. The shot mugging for the cameraperson makes me think how much work it was, that the "playing" was the natural and necessary spilling-over of pent-up energies from the intense concentration. Oooohhh! That face! Well done Mr. Wood! I often wonder, when I see rage enacted and the gritting of teeth, how the actor manages to not chip or break their teeth. They probably do from time to time. I often wonder, when I see rage enacted and the gritting of teeth, how the actor manages to not chip or break their teeth. Estë! I don't know. I guess I hadn't given it much thought. Viggo broke his toe from acting anger, and busted a tooth but I don't think that was from gritting his teeth. I think though that his teeth are not actually gritted (clamped together) in the shots as much as his jaw is rigid in a furious grimace. There's still room between his teeth for air to go in and out as he snarls and fumes.